Red water hibiscus is known scientifically as Hibiscus coccineus. It is aquatic and as such flourishes even in boggy conditions that other plants will find difficult to survive in. in terms of origin, the red water hibiscus can be traced to the southeastern part of the United States. It is a hardy hibiscus variety and as such its leaves and flowers do not closely resemble that of other species of hibiscus. This plant does not need much care as compared to the other garden plants making it a real showstopper. In diameter, the red water hibiscus flowers measure up to 8 inches. They have tall stems that can grow to a height of 8 feet. The petals are usually separated from each other making it a distinct species from other hibiscus plants. A close observation of the petals reveals a 5-spoke pin wheel arrangement pattern. This is why it is called the Texas star hibiscus. Hummingbirds often find its red flowers irresistible and so are the butterflies that frequent the white blossoms of the plant. There is a close resemblance between the foliage of this water hibiscus and that of Japanese maple leaves. Others mistake this plant for marijuana. This plant grows well in sunny weather with intermittent shades. The soil should also be rich in organic matter. This is why it does well in poorly draining sites, rain gardens and pond edges. 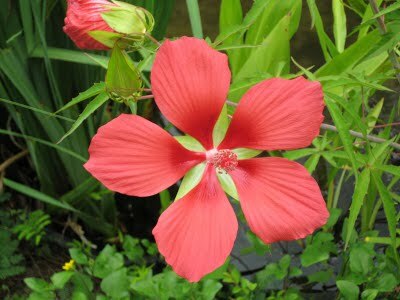 You can also plant the red water hibiscus in areas where it occasionally floods as this makes the plant flourish. In order to increase the flower production, you can use small amounts of fertilizer applied on a monthly basis. The plant can either potted or planted directly into the soil. The budding of red water hibiscus continues for a long time but the individual flowers tend to last for only a day. Unlike other plants which may require heavy pruning, red water hibiscus requires light pruning which enable it to produce more blooms.